Front: Eyebrow raise view 4 months - *Individual results may vary. Front: Eyebrow raise post 3 years - *Individual results may vary. Front: Repose view post 3 years - *Individual results may vary. Front: Smiling view post 4 months - *Individual results may vary. Front: Smiling view post 3 years - *Individual results may vary. She has congenital unilateral right ptosis (lazy eye) and undergoes initial ptosis repair on the right side but requires the left side repaired as well because the left side drooped (Hering's law). 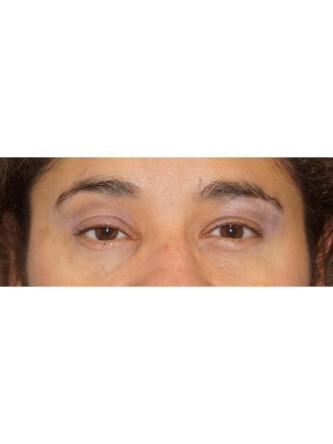 Post surgery 4 months and 3 year views show maintenance of the height of the eyelid on the right and nearly symmetric on both sides.